Virtual memory is a part of the hard disk that Windows uses like extra memory. Ifthis message appears in Windows XP, check that it is being managed properly. Now you can check the Virtual Memory usage in your Processes tab. 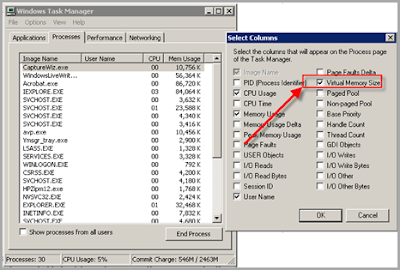 Click the top of the VM Size column to arrange the processes by their VM Size from largest to smallest. Every application will use more memory the longer you keep it open. This is one reason that Windows becomes more and more unresponsive the longer you keep it running, and why you end up eeding to restart your computer periodically.